Is it the end of the road for Andy Murray? The tennis audience is typically quite a sophisticated bunch – they know when to applaud, when to be quiet, when to yell their ‘vamoses’ and ‘allez’ and when to stay put. But there is one particular moment when all protocol and etiquette jumps out the window and that is when a player takes off his shirt to put on a dry one. Whistles and screams immediately ensue no matter where the tournament is taking place. Dubai is no exception and when Murray changed his shirt on Tuesday during a visit by the physio to his opponent Malek Jaziri, the crowd erupted. I asked Murray what goes through his mind when that happens. “Yeah, it doesn’t happen that often,” he said with a self-deprecating smile. The world No1 was in a humorous mood after his win over Jaziri on Tuesday night and he shared with us how he found out he had shingles earlier this month. It involves him pulling down his pants in front of his mother-in-law. “Well, like I had a little bit of a rash basically like on my bum ’round to kind of my stomach, and it wasn’t, like, terrible. But then, you know, normally like if you have like a little bit of a rash and you scratch it, it feels better. But with that, it was, like, really, really painful,” he said of the illness. “I didn’t think much of it at the beginning, and then it was actually my wife’s mum, we were having dinner, and I was, like ‘this is really irritating’. “She was, like, ‘Pull your pants down, show me. It might be shingles,” the Scot added as the room burst into laughter. “I was, like, ‘Okay’. “Then the next day got a doctor, and she was right. Yeah, I think her son Scott had had it, so she had seen it before. I’m happy to report that the rash is now gone, according to Murray. This time last year, Pouille was ranked No88 in the world and needed to play in the qualifying rounds before he reached fell in his main draw opener to Vasek Pospisil. Today, the 23-year-old Frenchman is ranked No15 and seeded No7 in the Dubai tournament after a stellar 2016 saw him rocket up the standings. “Well, I guess it’s going to be like this for a few months,” Pouille said with a smile. Pouille had to deal with a quick turnaround between his final appearance in Marseille on Sunday and his first round in Dubai on Tuesday afternoon. He lost to Tsonga in an all-French final in the south of France, then both finalists attended a football game between Olympique Marseille and Paris Saint-German together that evening before Pouille took a flight to Dubai and landed Monday night. “It was a good week (in Marseille). I arrived yesterday around 8:30 or 9:00, so couldn’t get used to the conditions, but, yeah, today I think I was solid enough to win. I’m very happy with the win,” said Pouille, who next faces Romanian qualifier Marius Copil. Pouille, a Dubai resident, spent time practicing with Roger Federer here in the Emirates during the offseason but suffered a foot injury early in the year that saw him retire from his second match in Brisbane and crash out of the Australian Open in the first round. “Well, we always learn, but obviously it was not easy to get injured second match of the year after good preparation,” said Pouille, who added that he’s feeling fit now. “I tried my best. I mean, we tried our best with my team to get ready for Australia. It was not possible. The excited group was joined by doubles players, John Peers from Australia and Romania’s Horia Tecau. The players had a practice session with the budding tennis stars and gave them some invaluable advice and top tips for the future. 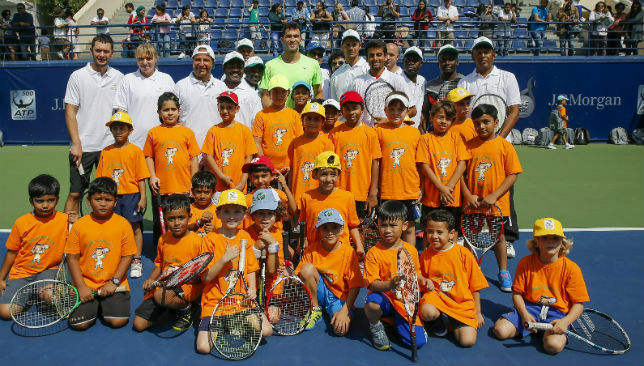 Speaking of his experience at the clinic and of the tournament, Tecau said: “The kids’ clinic is a nice way of giving back to the community, they were enjoying the practice session and you can tell they felt motivated by playing with professionals – we know how important it is to them.